Chamrousse, the Cime Rousse or Red Mountain in local dialect, can justly lay claim to being the cradle of downhill skiing in France. At about the same time that Sir Arthur Conan-Doyle was skiing furtively at night in Davos to avoid ridicule a Grenoble alpinist of some considerable repute, Henry Duhamel? had no such worries. He returned from the 1878 Universal Exhibition in Paris armed with a pair of Canadian snowshoes and some strange planks with upturned toes hed bought of a Swedish merchant. He showed off his purchases to his friends at Chamrousse. The use of snowshoes in winter was immediately obvious to all but what of these, what were they called again? Skis? Maybe Henry could demonstrate them. Embarrassed Duhamel had to declare that hed bought them without instructions and without any real clue how they worked. He searched his extensive library back home in Gieres and came across a Swedish encyclopedia dating from 1539 with tales of explorers crossing artic snowfields with the strange boards strapped to their feet. Duhamels first attempts involved using a sapling as an anchor to stop himself. Onlookers described how he would invariably miss this small tree and either end up on his bum or planting his face into the snow. Duhamel at least established that it was quicker to descend than to climb up. It wasn't until 18 years later, when two Norwegian officers visited Grenoble that the skiers of Chamrousse learnt the secrets of turning and stopping the beasts. Along with its swanky and famous cousin Courchevel, Chamrousse falls broadly into the second generation of ski resorts. That is, developed with significant participation by the department with a strong social aspect and no single promoter. The Jardin des Enfants of Bachat Bouloud on the Arselle plateau was designed by Laurent Chappis no less. The superb site has just been renovated and turned into private apartments. 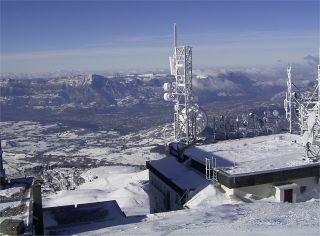 Today it is still largely the clubs and weekend skiers from Grenoble and Lyon that frequent the station. Ski tourists can take advantage of the flexible lift pass system to save a few meters of climbing.